It all started with a watercolor painting of a sticky bun. I almost ate the paper. 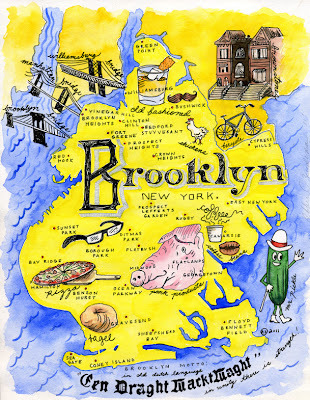 I've become obsessed with the work of artist, Abbie Zuidema, who splits her time between painting the most deliciously beautiful watercolors (that often have food as the subject) in her art studio and waitressing at one of my favorite Brooklyn restaurants, Vinegar Hill House. If life imitates art, then perhaps Abbie's work imitates life. I jumped at the chance to sit down with Abbie and get her thoughts on her favorite things to cook, discuss her work, and to see what's cooking in her creative future. Herewith, a Q&A that will leave you wanting to run out and buy paint supplies, lobster, and even Chef Boyardee. Trust me. Beyond food, what inspires your work? A lot of my work is about tapping into the nostalgia of childhood that we can't describe with language. It's so integral why we're drawn to the things that we're drawn to, and the things that we desire. Food, smell, taste, I don't know how to totally describe them because they're intangible, but it's what I'm after. Trying to define that for myself and tapping into that for other people through painting is the biggest gift. We love your watercolor paintings of Crisp Kringle Chocolate Santa and Chef Boyardee. How did these become subject matters in your work? I started thinking about creating a series of watercolor paintings about people's secret indulgences. So initially, I kept asking myself, "what is the thing that you eat that you can't admit out loud for comfort?" For me, it's a peanut butter and jelly on an English muffin, and no one needs to know about that. For my friend Lindsey, it is a can of Chef Boyardee spaghetti and meatballs. When I painted the Chef Boyardee watercolor, it was a little bit evil and scary looking, but I was also playing with color and keeping things very simple on purpose. 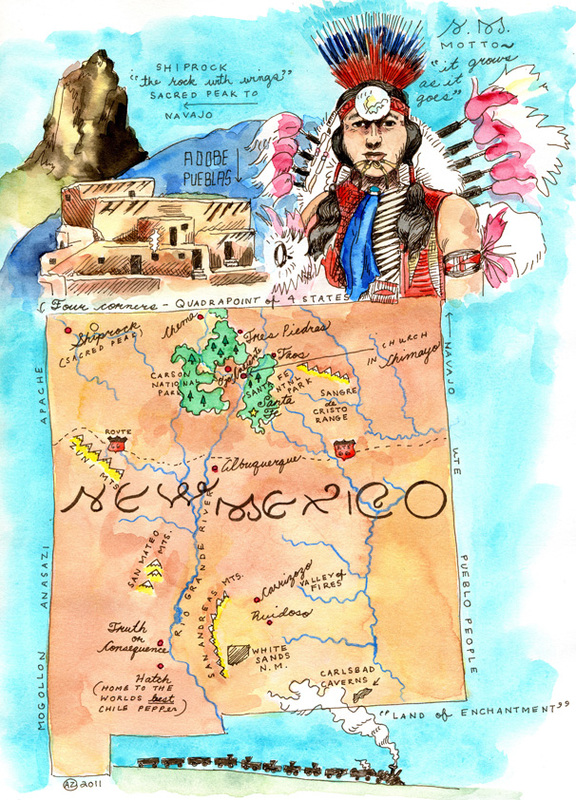 You're currently creating state maps with all sorts of amazing fun facts and imagery. How do you decide on what to include, and what is it about maps that you love? I love finding the history of places. In Alaska they have big foot sightings. In Montana, the names of the mountains are just so cool. In each state there is so much information. The more I've done them, the more I find amazing facts and the harder it is to decide what to include in the maps, but as you can tell, food always makes it's way into each one. I'm trying to keep it as simple as possible, but it's challenging because there's so much stuff to include in each map. 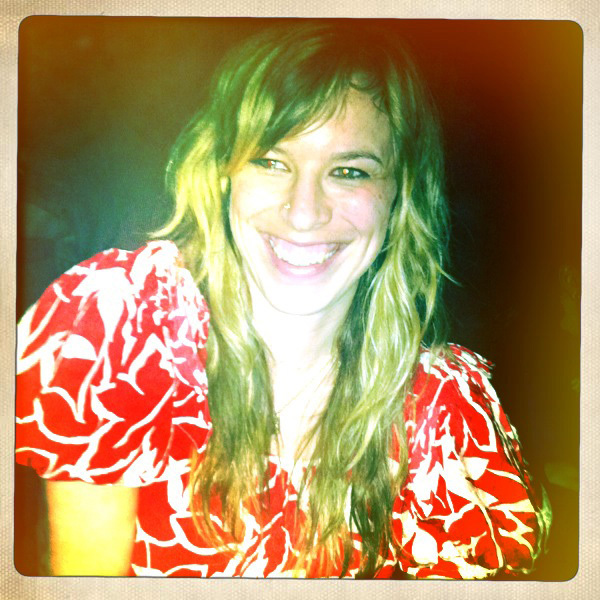 What's your blog, A Curious Nose, all about? pleasure where it is found & loving life with all of it's challenges," which is where we draw life philosophy & inspiration from. Do you two collaborate on food projects? Yes. 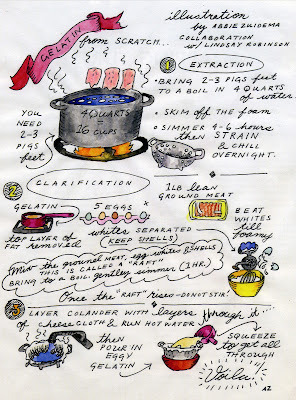 We've done a couple of different things, but one in particular that I loved doing was an illustrative watercolor recipe of making gelatin from scratch (featured in Diner's Journal). It was great because you get to find out about all of this cool stuff that's talking about something that's in cooking trends right now, but is also something from the past, in this case, a classic French technique. I find it reassuring to go back to a practice that's tried and true. 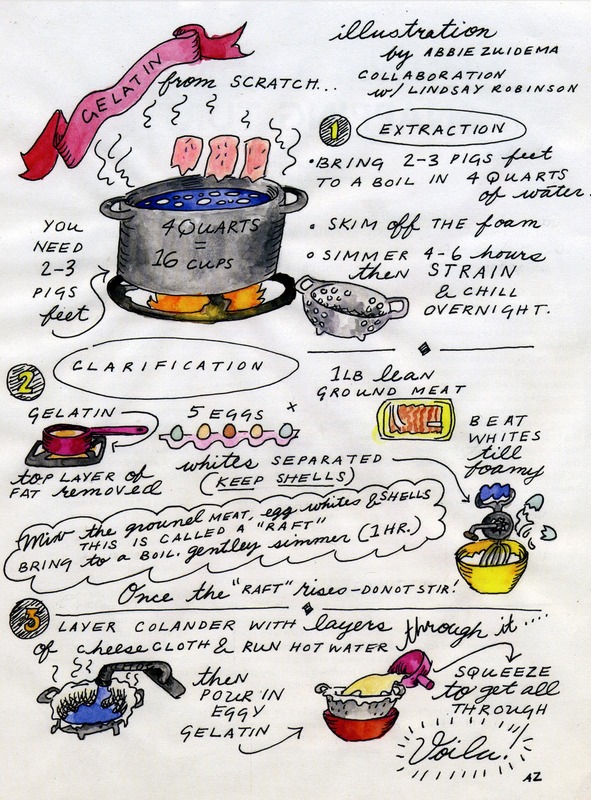 I'm really obsessed with Nigel Slater right now. I like going through his seasonal cookbook and trying different dishes that require marinating. I'm also into salsa verde, chimichurri and fresh herbs because of how they can pop your dish that create an incredible dimension to any dish. What's your favorite type of food to paint? I dig crustaceans, and red and pink things. 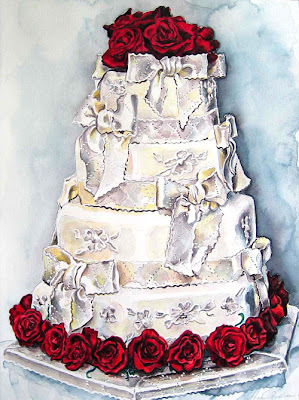 We've been told that you create customized paintings of people's wedding cakes. Is it true? Yes, I create customized watercolor paintings of menus, maps and wedding cakes. The personal connection is what drives me. I love collaborating with my clients and coming up with an end result that I could have never envisioned. Above, wedding cake, commissioned by Abbie's sister in law. 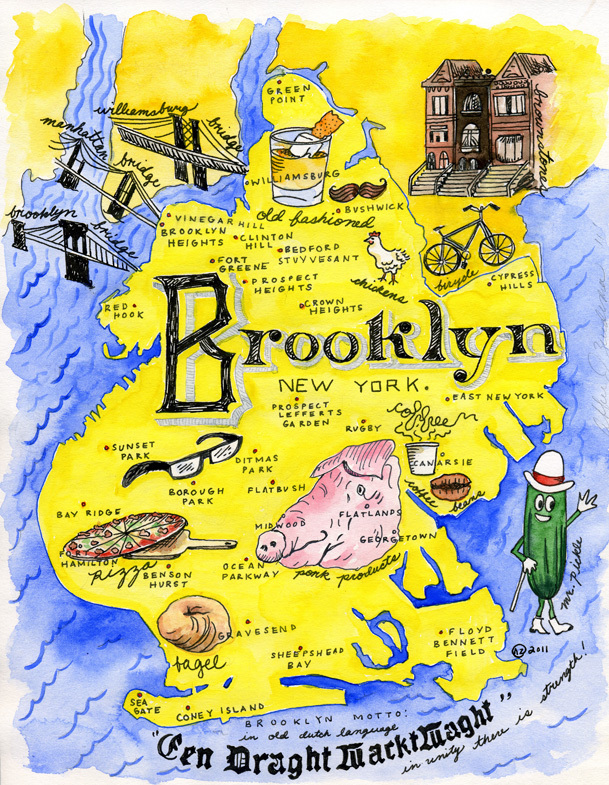 Right now I'm working on a map of Greenpoint because the hurricane gave me plenty of time. It's sort of an ode to Irene. I'm currently collaborating on designing menus for a new restaurant, and my map of Little Thailand in Queens is printed in the new issue of Edible Queens, currently out on newsstands in the New York area.